It’s that time of year again! Time for all things chocolate! At least that’s what all the stores seem to be telling me. Pink and red have taken over the stores, and you can buy chocolate in all kinds of shapes and flavors. But I have something better than the chocolate wrapped up in the pink and red wrappers. 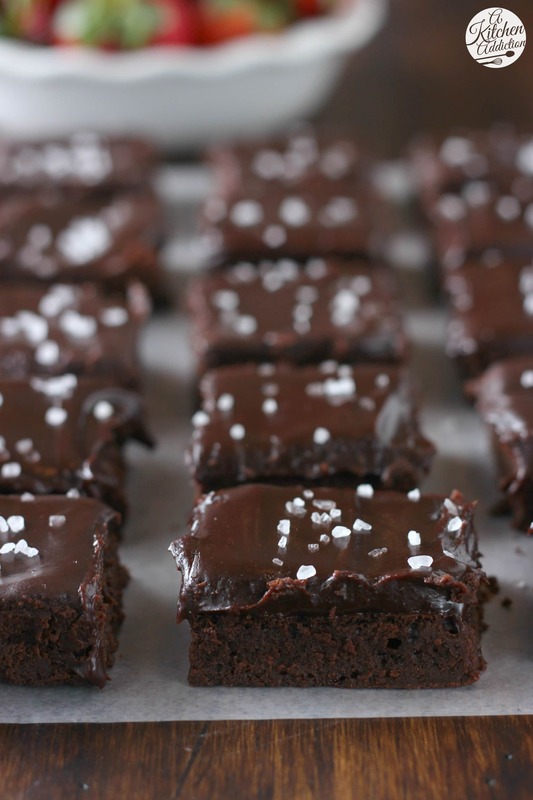 Fudgy flourless brownies topped with creamy ganache and a sprinkling of sea salt. So good. Dessert doesn’t get much better than this. The brownies are rich in flavor and fudgy in texture. You can’t tell because of the ganache layer, but the brownies have that perfect crackly top when they come out of the oven! The ganache is a simple combination of chocolate and half and half. To make it even better, a sprinkling of sea salt is added to give you that sweet & salty combo and an even richer chocolate flavor. I used dark chocolate (surprise, surprise!) in both the brownies and ganache because I like the intense chocolate flavor. The great thing about these is you can use semi-sweet (or even milk chocolate if you want) if you like your brownies and chocolate sweeter. Whatever chocolate you use, these brownies are sure to be a hit! No pink or red needed! Preheat oven to 325. Line a 9x9 inch baking dish with aluminum foil and lightly spray with non-stick cooking spray. In a medium saucepan, melt butter and chocolate together over medium-low heat. Stir constantly to prevent scorching. Stir in baking cocoa until smooth. Remove from heat. In a small bowl, whisk together sugar and eggs for a minute. Stir egg mixture into chocolate mixture. Stir in vanilla extract and salt. Pour into prepared baking dish. Bake for 18-22 minutes or until toothpick inserted in the center comes out mostly clean. While brownies are cooling, melt together chopped chocolate and half & half over low heat until smooth. Spread ganache over the top of cooled brownies. Sprinkle with sea salt. Refrigerate until ganache is set about 30-40 minutes. Can you send me a dozen? Ha! I will be making these. They look incredible! I totally choose these brownies over ANY box of chocolates ANY time. AMAZING. 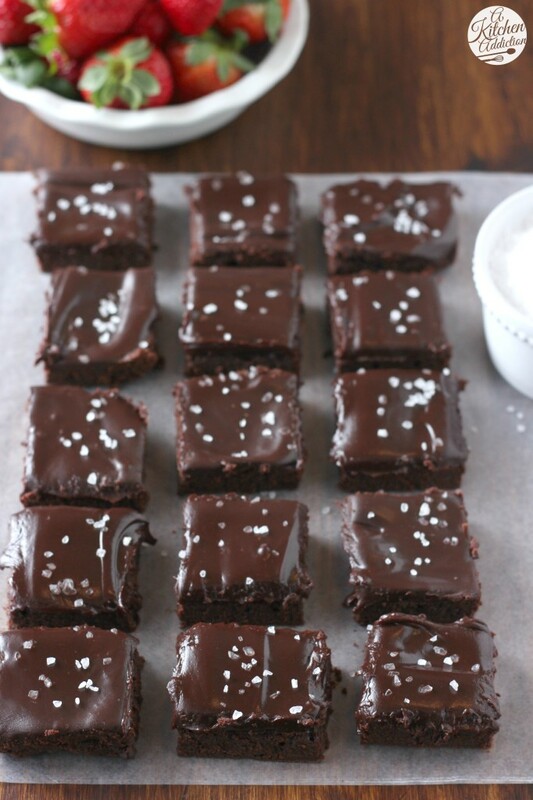 These brownies look mouthwatering! I love chocolate and this is one of my favourite desserts so will try your recipe ASAP. I love that these are flourless! I crave chocolate no matter what time of the year so I can’t wait to try these. The sea salt ganache is calling my name! I absolutely LOVE these brownies and that thick layer of ganache at the top! Jessica I think I just fell in love with a brownie! Flourless even better! everything about these looks phenomenal!! woah. 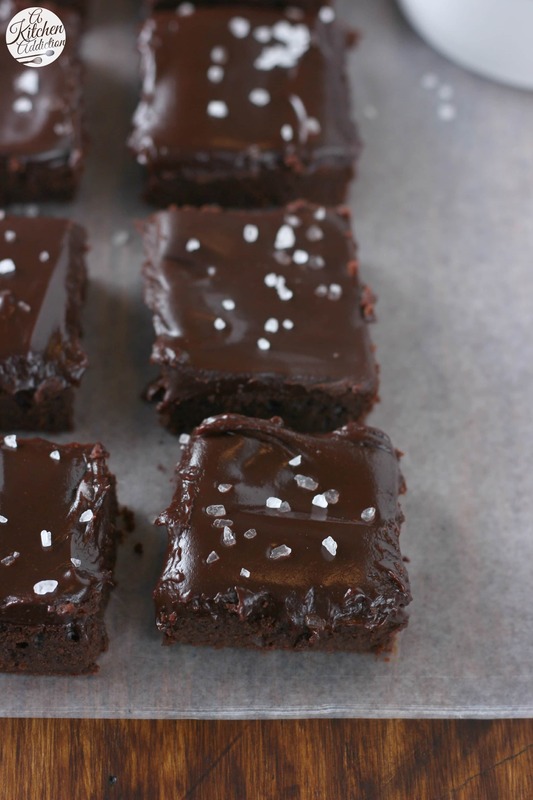 You had me at fudgy and sea salt! I am seriously dying over these!!! I cannot wait to try these! It sure doesn’t get much better! That frosting. OMG! I am in total awe of these brownies. I am all over fudey brownies and these are perfect for Vday! Ugh, I’ve picked a really bad time of year to decide to cut my sugar intake. These look TOO good! I might have to cheat! I saw these this morning and I haven’t stopped thinking about them all day! I’ve never baked any flourless desserts before but I love the concept and these just look so delicious! These brownies are perfect! I love that they are flourless and that thick ganache frosting looks heavenly! Printing this out right now! YUM! These look fabulous!!! I love flourless brownies and this combo looks like a winner. This is basically my dream brownie. Chocolate on chocolate plus sea salt! Yes! Send me a dozen! Oh that sea salt – just perfect. I love that you used the dark chocolate – my favorite! These look so so good. Chocolate is the best part of Valentine’s Day! LOVE how few ingredients these have, and that frosting and sea salt?! Dying! I love the way sea sat brings out the flavor of sweets. These brownies look amazing! Fudgy brownies are really a weakness for me. I could probably eat the whole pan! These look so amazing! I need to try these soon! 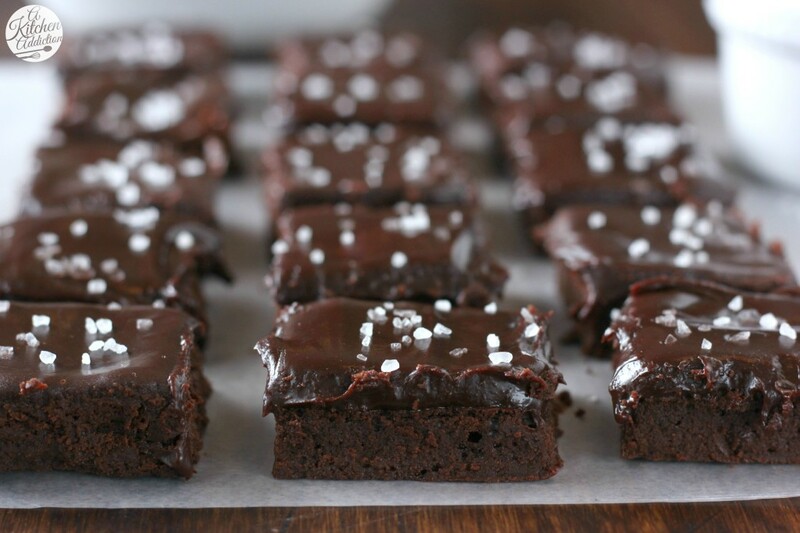 You had me at fudgy… then you convinced me with flourless.. I must try this recipe soon! I’m not sure I will ever tire of sea salt. Esp combined with a fudgy brownie! Made these today used a glass 8X 11 baking pan lined with parchment paper work out well. Very rich I also used all dark chocolate Yummy! May add sunflower or pumpkin seeds next time.